1 The day before: boil 2 litres of water together with the sugar, salt, pepper and coriander. Add the lemons, bring to the boil and cover with a lid. Leave overnight to marinate. 2 The next day: season the chicken breasts and fry on both sides in olive oil until golden. Add the shallots and the garlic and sauté until softened. Add 200 ml of water, add the star anise and the saffron, cover with a lid, and simmer on a low heat for approximately 20 minutes. 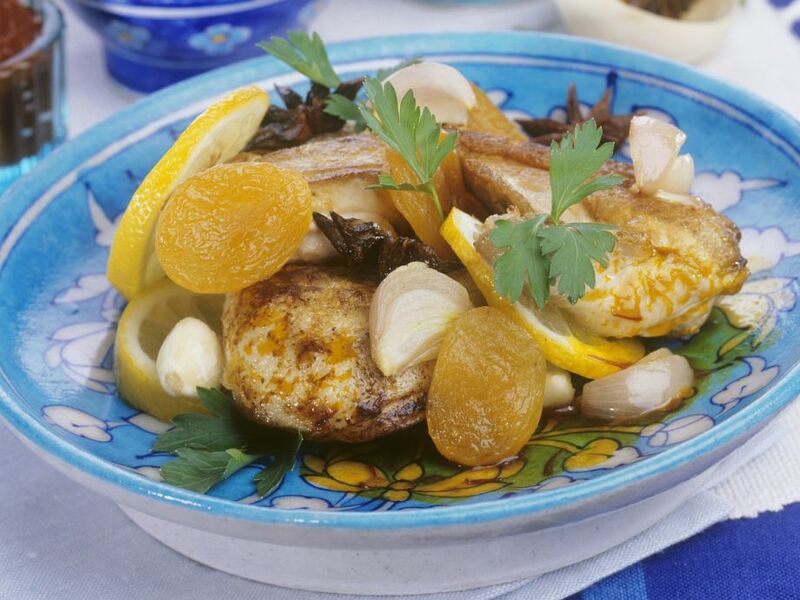 3 Cut the marinated lemons into slices and add to the chicken breasts along with the apricots. Simmer for a further 10 minutes. Season with salt and pepper. 4 Arrange on 4 plates, garnish with the parsley leaves and serve.